Who for – Those who are working with children and infants. It will be of particular interest to teachers, child minders, crèche assistants, playgroup personnel and anyone else who has a responsibility for their welfare whilst in your care. This two-day course satisfies the guidelines and criteria as laid down by the Early Years Foundation Stage (EYFS) and Ofsted. In order to obtain this qualification, you must attend both days and complete the two units of accreditation. 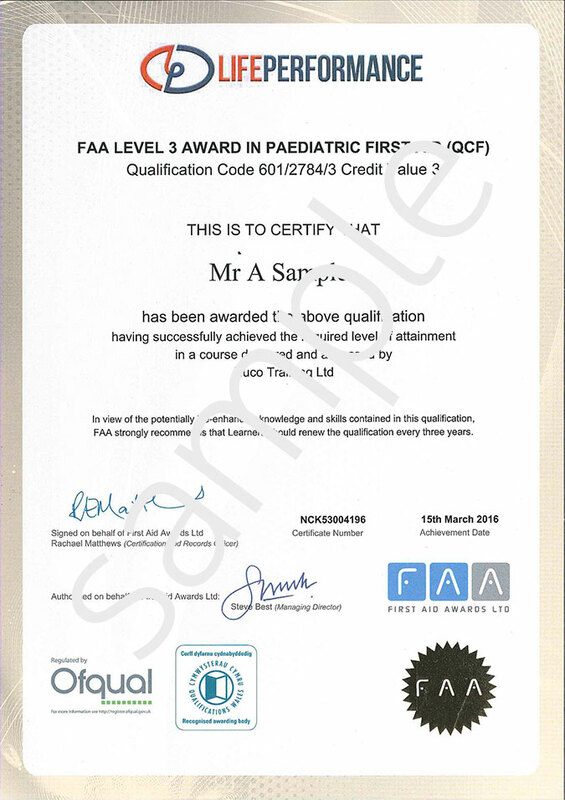 Awarding body – FAA level 3, Ofsted and early years foundation approved. Duration – 12 classroom hours, ideally over 2 days, however we can accommodate specific needs providing the course is complete within 6 weeks. Acts and regulations, first aid provision, responsibilities, scene assessment, hygiene, first aid kits, reporting, casualty priority, primary and secondary assessment, unconscious casualty, airway management, top to toe survey, recovery position, cpr, defibrillator training, choking, shock, fainting, bleed control, amputations, epilepsy, febrile convulsions, asthma, meningitis, sickle cell anaemia, diabetes, stroke, open fracture, closed fracture, support sling, elevation sling, spinal injuries, head injuries, concussion, compression, skull fracture, sprains, strains, dislocations, bruising, chest injuries, abdominal injuries, crush injuries, electric shock, anaphylaxis, poisoning, burns, chemical burns, hypothermia, heat exhaustion, heat stroke, eye injuries, embedded objects, splinters, bites stings. Price – £120 per person / £550 for groups of 5+.